If you’ve worked on your SEO, you probably have encountered someone stealing your position. To make matters worse you have no idea why they are out ranking you, it’s almost like they are just bribing Google. Generally, the reason they are out ranking you is detectable if you know where to look. This article will teach you exactly where to look to find what they are doing. A big mistake a lot of business owners make is mistaking their business rivals for their SEO rivals. Likewise, your SEO rivals are not always your business rivals. For example, here at Rhythm Design & Marketing we are a Website Design and Digital Marketing agency operating in Newcastle Australia. Our biggest competitors are about 15 other local agencies that offer the same service as we do. In our situation SEO is a major part of our customer acquisition strategy. A lot of our business comes from people searching Web Design Newcastle, Digital Marketing Newcastle, and SEO Newcastle. For these search queries our business rivals are also our SEO rivals. However, our SEO success is built around creating quality content for our website. We employ a long tail keyword strategy and try to rank for search queries like ‘average cost of web design for small business’ or ‘SEO step by step guide’. We do this with the goal of generating more traffic from these search queries This will ultimately help use ranking for other search queries like website design Newcastle. Thing means our SEO competitors for long tail keywords aren’t our business competitors. Companies like Forbes, Business Insider, Search Engine Land and Moz are generally our competitors for our long tail keywords. However, they don’t offer the services we do; we just compete with them for blog traffic, which makes them our SEO competitors. These steps will enable you to see your SEO competitors ranking for your keywords. You will be able to compare your rank with their rank for certain keywords, in certain search engines. Open the Rank Tracker program in SEO Power Suite and enter your website URL. Paste 20 – 30 keywords that you want to target and click finish. Note: Keep all target search engines checked, and don’t worry about connecting Google AdWords and Analytics accounts. Once the rank check has run, click Preferences in the top menu, then Competitors, then click Rank track will find your biggest competitors based on the keywords you entered earlier. Keep all target search engines checked. Add the competitors to the project for further research. Note, if you have the free version of SEO power suite you will only be able to able one competitor per project. If this is the case for you, just add the first competitor on the list. Before trying to reverse engineer your competitor’s SEO strategy, it is important to get an understanding of their strengths. This is vital as it will give you an idea of how much work will be required to out rank them. Your goal in SEO is to increase the quantity and quality of traffic to your website. Sometimes it’s too hard to out rank competitors for particular keywords and your SEO efforts can be wasted. We can check our competitor’s SEO strengths using rank Tracker again. We do this by comparing your competitor’s domain strength to your sites. Continuing from the last steps, click the Domain Strength tabs on the left-hand side bar menu of Rank Tracker. To compare the Domain Strength factors between your website and your competitors, scroll down the page and examine how domains’ InLink Rank, Alexa, domain age, indexation stats, backlink details, and social media signals. This will give you an idea how your website compares to your competitors in several SEO factors. In the left-hand side menu click Target Keywords, then Keyword Map from the drop down. 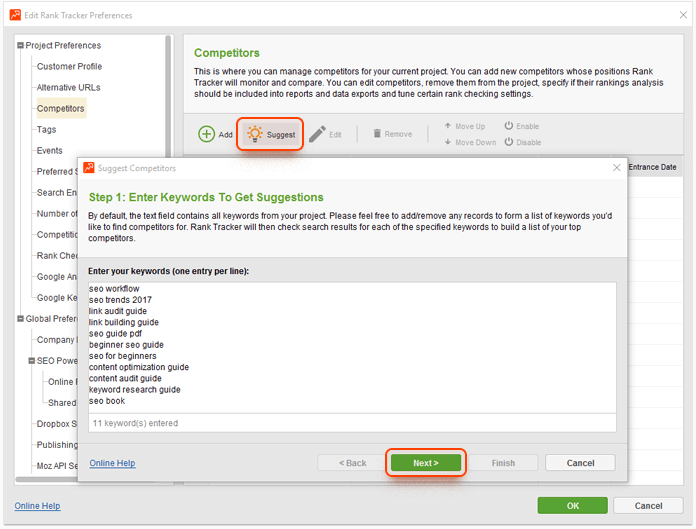 Select All Keywords, and select the keyword you want to compare, the select Update Keyword Difficulty. This will give you a detailed breakdown of how hard it will be to rank for these keywords. This score represents how good your competitor’s SEO is related to these keywords. InLink Rank: This estimates the ‘ranking power’ of each web page based on the quantity and quality of backlinks. The higher the score, the stronger the individual pages backlink profile is. Domain InLink: Is the same as the InLink Rank, however it shows the ranking power of the entire website, instead of the individual pages. Sites Linking to Page: is the number of websites that have links to the individual web page. Sites Linking to Domain: Is the number websites link to the domain. On-page Optimisation: Is a calculation of how well each page is optimised for the keywords. Alexa rank: the sites ranking according to Alexa, the smaller the number to more traffic your website receives. Domain age: How long the domain has been registered for. Open SEO SpyGlass and enter your websites URL. Click Domain Comparison In the left-hand side menu and add your competitor’s URL. If you have the free version of SEO SpyGlass you can only add two competitors. This will produce a report that will allow you to compare your backlinks to your competitors, so you can figure out what aspects to work on. The Link Intersection module will help you build backlinks, click on Link Intersection under Domain Comparison in the left-hand side menu. Click the Potential backlink Domains tab at the top of the page. This page will display all the links that are going to your competitor’s websites and not your site. This will allow you to try to build backlinks from the same sites.